In the fall of 1859, after a significant uptick in the number of US-owned ships traveling to the west coast of Africa to illegally acquire people to sell into the Cuban sugar industry, President James Buchanan ordered that US Navy steamers blockade Cuba in an effort to intercept these vessels and curtail US involvement in the illegal trade. Four Navy steamers – the Mohawk, Wyandotte, Crusader, and Water Witch – were stationed around the island with the express purpose of intercepting and seizing illicit, US-flagged slave ships. In the spring of 1860, that strategy met with tremendous success: Three slave ships, each carrying nearly 500 African people, were captured. The first illegal slaver to be apprehended was the bark Wildfire. The Wildfire had sailed for Africa from New York City on December 16, 1859, with a large cargo of guns, gunpowder, cloth, and other trade goods, as well as an overabundance of food. Sometime later, at the Congo River, Wildfire took on board nearly 600 Africans. After a 36-day Atlantic crossing, the bark was sighted by the USS Mohawk off the northeastern coast of Cuba. The slaver was intercepted by the navy crew was found to be loaded with Africans. The crew of Wildfire was arrested and put in irons on board Mohawk; Wildfire was taken undertow and brought to Key West, Florida, the nearest US port. There, the small population of the remote, island city was surprised by the arrival of over 500 naked and hungry refugees to whom they were expected to play host. Key Westers, created quite a stir and many of the island’s residents went to the docked Wildfire to see the new arrivals. One of those was a reporter for Harper’s Weekly, a popular, illustrated newspaper published in New York and distributed across the US. The reporter noted that there were roughly 50 men, 400 boys, and 60 young women and girls in the group. There was much marveling over the Africans’ looks—many had filed teeth, ritual scarifications, or hairstyles that were unusual to the Americans. A small number of the Africans could speak Portuguese—an indicator that they came from areas that were Portuguese colonies, particularly Luanda near the mouth of the Congo River. Some also engaged in Catholic prayer rituals, another indicator of their colonial upbringing, and one that surprised the Key Westers. It was also noted that many of the Wildfire’s Africans were quite ill with diseases contracted aboard the crowded slaver. The day after the reporter visited the Wildfire, the Africans were taken to the compound Marshal Moreno had built for them. 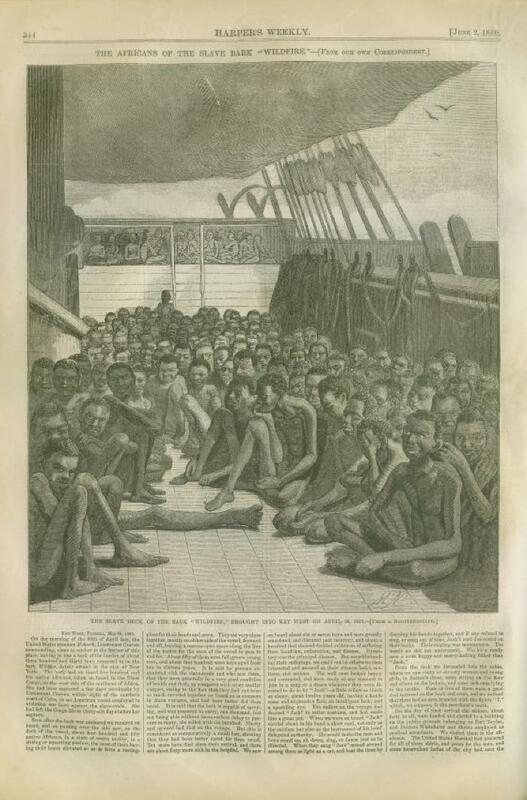 The large, full-page print featured in Harper’s Weekly is one of the few images to depict an authentic scene of Africans on board a slave ship engaged in the Transatlantic Slave Trade. In an interesting aside, the caption of the print notes that it was based on a “daguerreotype,” the prevalent type of photograph in the mid-1800’s. This means that, originally, a photo was taken of the Africans on board the Wildfire, and the print was sent to the Harper’s office in New York for an engraver to make a plate from. If that daguerreotype photograph were to be found, it would be a unique piece of world history!